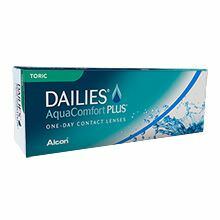 Dailies AquaComfort Plus Toric contact lenses are perfect for people with astigmatism, as they are designed to remain stable on the eye all day. Ideal for those leading a busy lifestyle, these daily lenses require no overnight storing, providing you with a convenient, fuss-free wearing experience. Thanks to their triple action moisturising agents and blink-activated moisture technology, Dailies AquaComfort Plus Toric contact lenses are ideal to keep your eyes healthy and hydrated throughout the day. Buy your Dailies AquaComfort Plus Toric contact lenses from [COMPANY_NAME}, and enjoy crisp and clear vision with minimum hassle. At NextdayLenses.com, we work hard to ensure that you customers receive your lenses right when you need them; this is why we dispatch most orders on the very same day, and deliver them directly to your door.